Looking for a yummy make-ahead side dish? 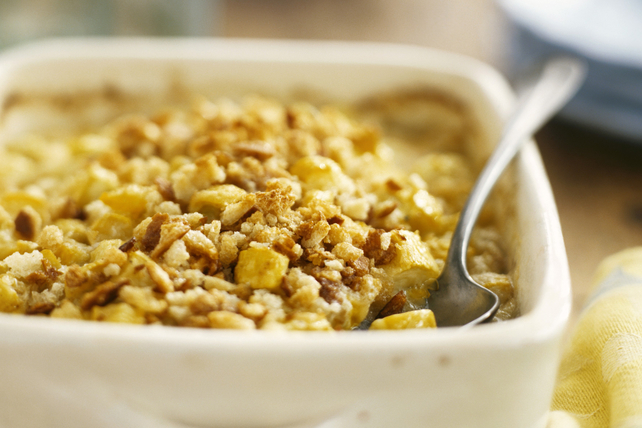 You'll want to try our Creamy Butternut Squash & Stuffing Bake. This comforting side is sure to become a new family favourite. Peel squash. Cut lengthwise in half; remove and discard seeds. Cut squash into 1-1/2-inch pieces; place in large saucepan. Add enough water to cover squash. Bring to boil on high heat; simmer on medium-low heat 8 to 10 min. or until squash is tender. Meanwhile, bring 1 cup water to boil in medium saucepan. Remove from heat; stir in stuffing mix. Cover; let stand 5 min. Drain squash. Return to saucepan. Add cream cheese product and Parmesan; mash until squash is desired consistency and ingredients are well blended. Spread squash mixture onto bottom of 13x9-inch baking dish sprayed with cooking spray; top with stuffing. Butternut squash has a smooth beige skin with slightly bulbous base. Typically weighing between 2 lb. (900 g) and 3 lb. (1.4 kg), this winter squash has an orange-yellow flesh with a sweet, slightly nutty flavour. To prepare, simply cut off both ends of the squash and peel before cutting squash lengthwise in half. Scoop out and discard the seeds and stringy fibres, then cut squash into cubes or slices as desired. If desired, squash can be cut up in advance. Store in tightly covered container in refrigerator up to 24 hours before using as desired. This satisfying side dish can be prepared ahead of time. Spread squash mixture onto bottom of prepared baking dish but do not top with prepared stuffing. Refrigerate up to 24 hours. When ready to serve, prepare stuffing as directed, then sprinkle over squash mixture and bake in 350ºF oven 40 to 45 min. or until heated through.